The doom and gloom that centered around Duke basketball and Tre Jones on Monday night seems to have dissipated, to some extent. Duke kicked out good news on Thursday: the AC joint separation isn’t as bad as some feared. Jones will not miss the remainder of the season; in fact, he’s expected back sooner rather than later. According to Mike Krzyzewski, it’s highly unlikely Jones will play in Saturday’s marquee matchup with No. 4 Virginia; however, he could be back not too long after that. This is monumental news for Duke, obviously. While loaded with talent — including the likely No. 1 pick Zion Williamson, R.J. Barrett and Cam Reddish (plus some good role players) — Duke needs Jones’ playmaking and daring on-ball defense. 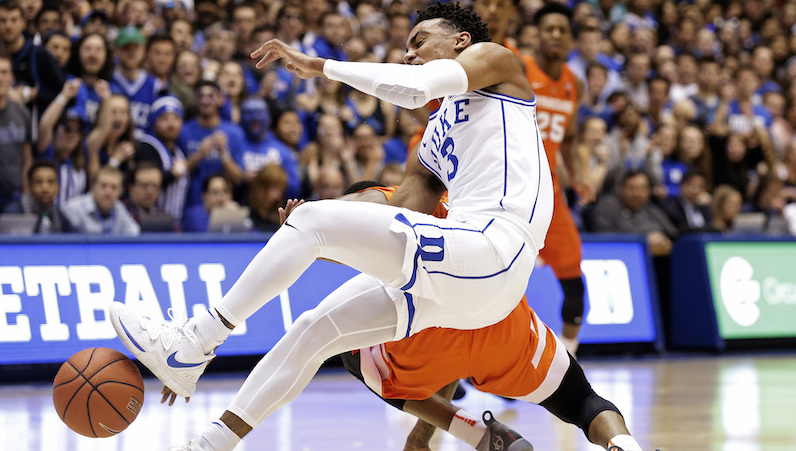 A gifted passer, Jones manages risk well, too; he leads Duke in both assist rate (27.5 percent) and has a sub-12 percent turnover rate, which is excellent. Jones also ranks inside the top 70 nationally in steal rate (3.7 percent), per KenPom. After the Virginia game, Duke has three straight ACC contests: Pittsburgh, Georgia Tech and Notre Dame — all which rank outside the KenPom top 65. After that trio of games, Duke is home to St. John’s and the dynamic Shamorie Ponds. Speaking of Reddish: After missing the overtime home loss to Syracuse, the future lottery pick, who was coming off one of his best games in a Duke uniform (the FSU win), will play on Saturday against Virginia.